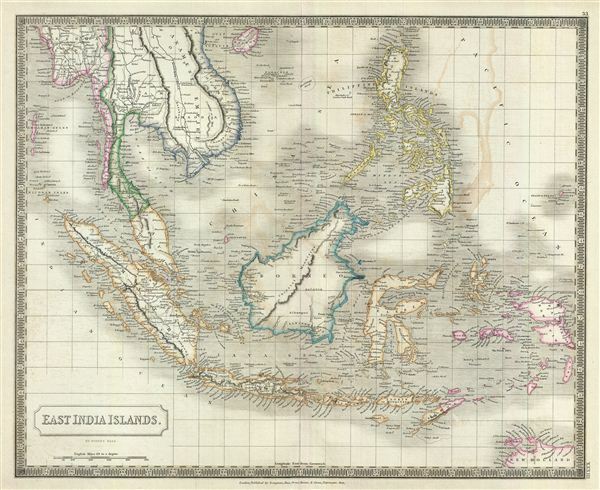 This is a beautiful map of the East Indies from Sidney Hall's extremely scarce 1835 New General Atlas. It covers from Burma (Myanmar) south as far as New Holland (Australia) and from the Andaman Islands eastward as far as the Philippines and New Guinea. It includes the entire Malay Peninsula, much of Southeast Asia (Thailand, Cambodia, and Vietnam), and the East India islands of Sumatra, Java, Borneo and the Philippines. The Strait, Island, and City of Singapore are all individually identified. The map offers wonderful detail regarding the coastal area of the region. Also shows some nautical details, including shoals near Borneo and the Philippines. In Southeast Asia this map notes the kingdoms of Siam (Thailand), Tonquin (North Vietnam), Cochin China (South Vietnam), Laos, Cambodia, and Pegu (Burma). During this time in history, Burma was under British rule, while much of modern day Indonesia including Sumatra and parts of Borneo were part of the Dutch commercial colony of the Dutch East Indies. The French dominated Indochina, including Cambodia and Vietnam and most of the modern day Philippines were a Spanish territory called Spanish East Indies. Only Thailand (Siam) and China retained national sovereignty. This map notes towns, islands, bays, shoals, mountains and various other important topographical details. Elevation throughout is rendered by hachure and political and territorial boundaries are outlined in color. Rumsey 4224.034 (1830 edition). Philips (Atlases) 758. Ristow, W., American Maps and Mapmakers: Commercial Cartography in the Nineteenth Century, p. 303-09.